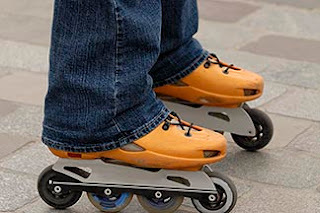 Someone in the FT wrote recently that there’s no middle ground on rollerblades. Apparently, you either leap to your feet and zoom about confidently like a Starlight Express chorus-girl or you stand jerkily like a newborn foal and roll awkwardly away with arms flailing, like a cartoon character on a banana skin-strewn pavement. Actually, I don’t think that’s quite true. There is a third way. A way that involves a forty-two year old skating in a fairly stately way up and down the paths of Hyde Park, neither falling over nor doing pirouettes. Each Monday night this month, I’m taking skating classes with Citiskate – an organisation founded by an ex-merchant banker who decided life would be more fun if he eschewed the markets and dropped out into rollerblading instead. I’m in a class with a whole bunch of twentysomethings and the odd oldie like me, all of us enjoying pretending to be eighteen again… Or even eleven. Last night I learned how to skate up a kerb, how to stop without bumping into people and how to do ‘lemons’. It’s enormously fun. And I only fell over twice.